The cobalt blood test checks the cobalt blood level. What is a cobalt blood test? The cobalt test measures the cobalt blood level. Why is a cobalt test important? The cobalt blood test helps screen for cobalt toxicity / cobalt poisoning. How do I prepare for the cobalt blood test? If possible, mineral, vitamin B12 and vitamin B complex supplements should be avoided for 72 hours before getting cobalt testing. This Cobalt Blood Test is a blood test. The cobalt blood test, also known as a cobalt test and cobalt lab test, measures the cobalt blood level. Cobalt is an element with the symbol Co. Cobalt is a silvery metal which is used industrially due to its magnetic properties and strength, particularly when used in making metal alloys. Cobalt's bluish tint also makes it a desirable component to paint, glass and ceramics. In humans, cobalt is used in vitamin B12, or cobalamin, which is necessary in nerve function and metabolism. Cobalt is frequently absorbed in our diet from animal products and most of the unused cobalt is excreted through the urine and the rest through the stool. In high doses, cobalt can cause cobalt toxicity or cobalt poisoning in humans. Cobalt toxicity sometimes occurs due to excessive cobalt exposure from the environment and from contaminated food. Surgical implants are another cause of cobalt poisoning and, when this is under consideration, this cobalt level test is sometimes done at the same time as chromium toxicity testing using the chromium blood test. Cobalt toxicity can lead to heart problems (cardiomyopathy) and, with excessive contact, skin rashes. To get a cobalt blood test near you, order online and get tested at the selected Quest Diagnostics lab. Once the cobalt lab results are ready, they will be available for electronic download. 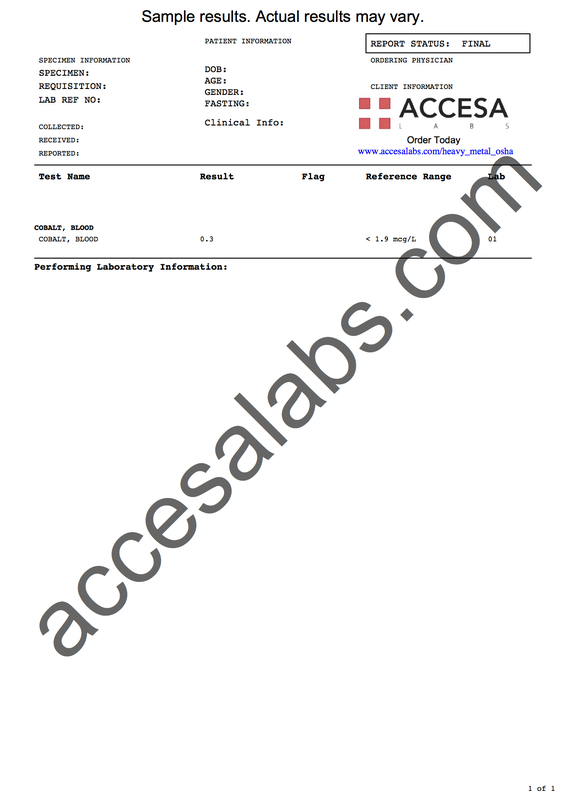 As can be seen on the sample cobalt lab report above, the cobalt blood level will be reported as a numerical value which can be compared against the reference range provided by the lab. Cobalt Blood Test at Guaranteed Prices.